Perhaps, your old kitchen blender has gone! We sympathize with this unfortunate incident. Besides, the time has given you an opportunity to meet a new one. Having something new is always exciting. But buying a new blender is not that easy. A blender with latest technologies should fulfill all your kitchen needs nowadays. 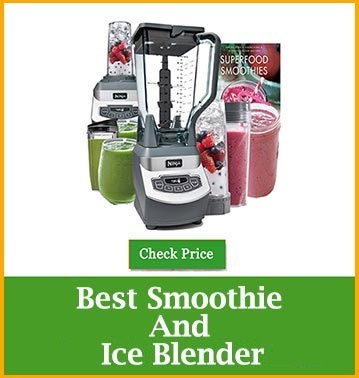 A modernly equipped blender usually costs too high. It is likely that we have found a suitable one for you. If you are looking for a compact blender as well as on a tight budget, Oster pro 1200 plus is a great pick. You’ll have both freedom and flexibility with it. 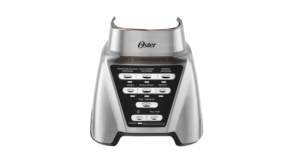 Oster Pro 1200 plus is one of the bestselling blenders introduced by Oster. It is designed in North America and assembled in Mexico. This model has almost the same features of Oster 1200 3-in-1 blender except for the food processor. Let’s know in detail about this amazing kitchen tool. 1200 power watts, 900 watts of ice crushing. 7 speeds including 3 pre-programmed settings. 6 cups (1.41 liter) glass jar, 24 oz. smoothie cup. Thermal shock tested, dishwasher safe. If you’re tired of guessing the right button to press of your old one, this should sound interesting to you. With its 3 pre-programmed settings, your blending hassle will reduce dramatically. You just have to push the button and it’s done! These settings are named as Green/ Frozen Smoothies, Food Chop/ Salsa, and Milkshakes. There’re 3-speed settings and pulse as well. You would like this compact machine that fits under most kitchen cabinets. The motor generates 1200 watts power which is quite impressive comparing the size. It’s totally able to not just making perfect smoothies but also frozen drink, salsa, puree, soup and crush ice. Oster says it uses 900 watts of power for crushing ice. Don’t be frightened of its loudness. Let it do its work. Every blender has stainless steel blade so has it. But, when it comes to 50% extra-large, that must be unique. 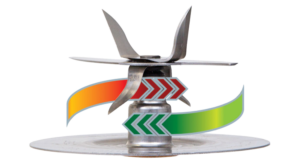 Its 3.5” blade reaches the maximum range what most ordinary blades fail. So nothing misses from the sharp cut. The blade is able to break ice to snow in few seconds. It chops any kind of frozen or whole-fruits, vegetables and other ingredients very well. The blade works using dual direction technology. So, it rotates smoothly without being stuck by ingredients. The motor spins it at over 19000 RPM. Food odor is a common bother that most plastic blending containers retain. You’ll never face such experience with its Boroclass glass jar. The jar is scratch resistant that remains shiny for a lifetime. You’ll enjoy blending hot coffee and soup in this Thermal Shock tested pot. But be careful and keep your hands away while blending hot ingredients. For safety, we suggest to place a kitchen towel on the lid and hold as you blend. 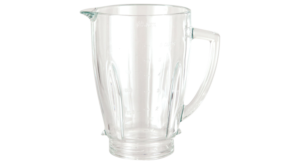 Will ice crushing crack the glass pitcher? Absolutely not. Oster recommends 5 to 7 ice cubes at a time depending on size. The main blending jar holds 6 cups (about 1.41 liter) of liquid for multi-serve. You will get a 24-ounce smoothie cup as well to blend and enjoy right away for personal use. Oster pro 1200 plus Duralast™ all-metal drive assures its physical longevity. Containers and blades are made of BPA free material that doesn’t harm your health. You can use any kind of dishwasher for cleaning. Fill the jar halfway with water and add few drops of a dishwasher. Now press the pulse button for 30 seconds. You can hand-wash too, but be careful of the sharp blade. Oster is famous for supplying parts and accessories. 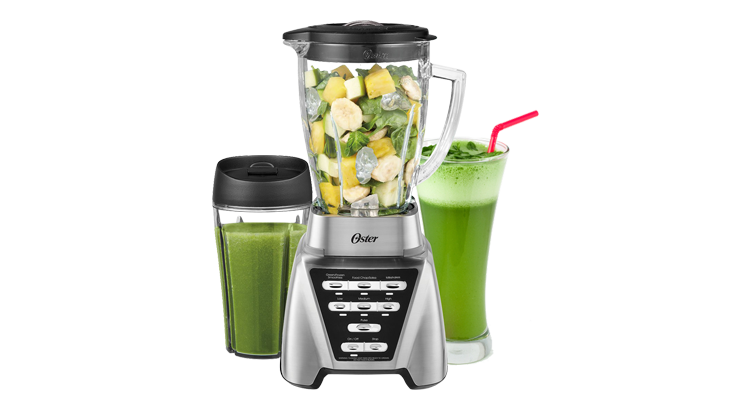 If any part or accessory get damaged or lost, you don’t have to buy a new blender. You can purchase the same thing from Oster at a cheap price that keeps it on track again. Designed for both single and multi-serve. You don’t have to buy two separate blenders. One of the cheapest blenders with such amazing features. Thermal shock tested glass jar blends both cold and hot ingredients. Powerful motor for everyday kitchen use. Extra-large blade reaches the maximum range and chops any ingredient properly. Duralast™ metal drive for long lasting. Retail parts and accessories are available. The motor generates 1200 power watts, but it works with 900 watts. The glass jar is heavy to carry. You have to keep it safe from falling. Designed for kitchen use only. You shouldn’t use it for commercial purpose. Is Oster pro 1200 plus worth buying? Oster pro 1200 plus is an ideal compact blender for someone, who is looking for a mid-budget kitchen tool with some impressive features. 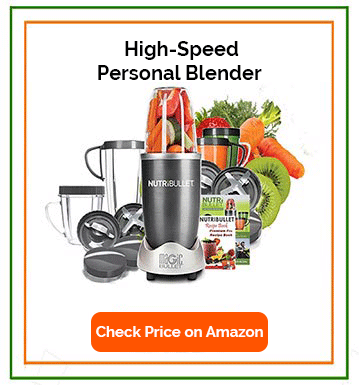 If you are planning to use a blender once or twice a day for making smoothies, shakes, salsa, and soup for the entire family or single serve, this is a nice performer.